Winning isn’t everything. But when you set out to make Mad Hot Ballroom, Murderball, or Spellbound, you hope that the subject of your documentary will turn out to be a champion. When Steve James set out to make Hoop Dreams, he probably hoped his movie would look something like Through the Fire. With the fall in the price of good-quality video cameras and the rise of the documentary, it was only a matter of time before someone finally scored. If you don’t already know who Sebastian Telfair is, then maybe you’ll enjoy the suspense. As Through the Fire opens, Sebastian is a senior in high school. He’s the most promising young member of his high school basketball team, and he lives, breathes, and drinks basketball in a Coney Island neighborhood that takes basketball very seriously. Sebastian’s brother Jamel Thomas had hoop dreams. He might have been good enough for the NBA; he even entered the draft, but he was never picked, and on that day, his lifelong career aspirations were crushed. Now he plays pro ball in Greece and he works very hard. It’s not the NBA, though, and a cloud of disappointment seems to hang over his life story. He loves Sebastian and hopes he succeeds, but at the same time doesn’t want to see his little brother hurt. 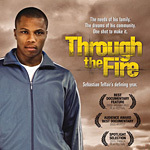 Through the Fire follows Sebastian through his high school season. As the year progresses, the hype surrounding him grows and grows. Which college will he declare? Will their team win the state championships. Is he maybe good enough to enter the NBA draft straight out of high school? Will the hype crush him under its immense weight? It’s a great story and filmmaker Jonathan Hock was present enough in Sebastian’s life to capture it all. What makes this a winning movie is Sebastian himself, who has the nice-guy charisma of Derek Luke. He’s easy to root for, and it’s easy to believe he’s as good as they say. He’s only a senior in high school, though, so it’s easy to spot his mistakes from the audience. In the movie’s most interesting and heartening development, when Sebastian starts hearing the first few notes of the siren’s song, his big brother snatches him away to the islands of Greece and lashes him to the rim. If Through the Fire got a theatrical release, it escaped my notice. Maybe it played on the coasts, but for most of us, it seems to be a straight-to-DVD release (it’s actually an ESPN movie, so maybe it was meant for cable from the start). But in the case of a documentary shot on video, that hardly needs to be a concern. The picture quality is generally very good, although Through the Fire includes some footage from less-than-ideal conditions. More importantly, sound quality is very good. Sebastian is often miked while playing his heart out, and we get the sensation of being on the court with him. Though I hesitate to call this a DVD review (I barely skimmed the extra features), I did watch the Q&A session from Tribeca. It was refreshing to see Sebastian taking questions and being as charming as ever. I particularly liked his answer to the question about whether the cameras changed his behavior. Yes, he said. Since the cameras were always around, he probably behaved himself better than he might have otherwise been. Call it an unfair advantage if you will. Or chalk it up to the power of documentaries.